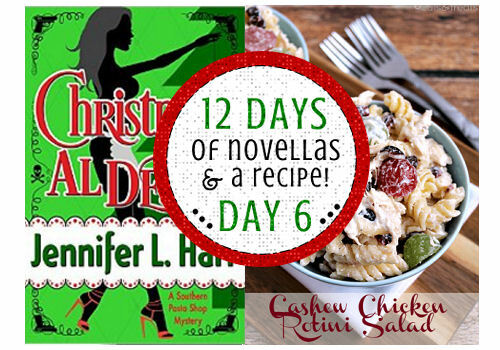 12 Days of Novellas – Day 6: Christmas Al Dente by Jennifer L. Hart: Review + Recipe! I can't believe we're already half way through our 12 days of Novella's! Join me today as I'm serving up a festively-colored, contributed pasta recipe and the review of Christmas Al Dente by Jennifer L. Hart! This entry was posted in 12 Days of Novellas, Book Reviews, Christmas, Kindle Downloads, Seasonal: Winter and tagged cashew chicken salad, Chick Lit, chicken salad recipe, christmas al dente, christmas al dente downloads, christmas al dente review, christmas cozy mysteries, christmas kindle, christmas novellas, download christmas kindle, good christmas mysteries, Jennifer L. Hart, Novellas.